1901 – Founding of the company by Jakob Hasslacher, great-grandfather of the current owner Christoph Kulterer. 1905-1914 – Operation of the pulp mill which was built in 1901 was extended with trade in timber; agricultural and forestry land was acquired and pioneer Jakob Hasslacher opened it up with access roads. Jakob Hasslacher took over his father-in-law's business with a small saw mill. 1952 – Jakob Hasslacher acquired all shares in the company Brüder Hasslacher in Hermagor and handed this company over to his son Dr. Herbert Hasslacher. 1958 – Jakob Hasslacher handed over his companies in the Drau Valley to his grandson Dipl. Ing. Herbert Kulterer. 1998 – Fire in Sachsenburg; rebuilding and expansion with Linck and Springer systems and purchase of the Gebrüder Feltrinelli Drauland company. The plants were merged to form Hasslacher Drauland Holzindustrie GmbH. 2000 – Setting up of the HASSLACHER district heating supply; Sachsenburg and Möllbrücke are supplied with district heating. 2001 – Entry into glue laminated timber production on establishing the NORITEC GmbH company in Stall in the Möll Valley. 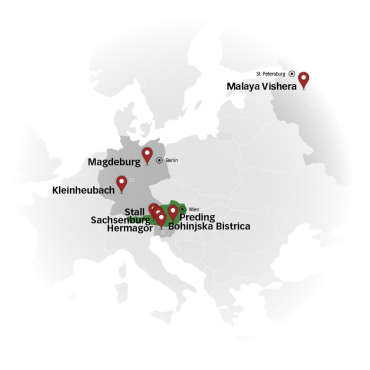 Following a fire, one of Europe's most advanced glue laminated timber plants was built in Sachsenburg in 2006. 2011 – Purchase of the Ökohaus company in Stall in the Möll Valley and expansion of cross-laminated timber production; Buchacher Holzleimbau GmbH in Hermagor was also taken over. 2015 – Increased ecological approach to production. Installation of photovoltaic plants at various locations with an overall peak output of 3.6 MW. Shares in Lip Bohinj d.o.o. increased from 35% to 75%. 2016 – 24% stake in SWA Systembauteile GmbH which produces wood-concrete composite elements. Majority acquisition (75%) of HESS Timber in Kleinheubach (D) with the aim of taking modern architecture and engineering wood structures to a new level. 2017 – The RUBNER corporate group has sold Nordlam GmbH and Abbundzentrum Nordlam GmbH (cutting centre) to the HASSLACHER group.